I am just back from the 2014 Spectra Precision Dealer meeting in New Orleans. It was a blast and there were plenty of BIG announcements. It is about 15% smaller than the PM800 and shockingly it is a ½ lb. lighter (2.5 lbs. total) And that is with almost double the battery life. When you hold this receiver it feels right, the finish is exceptional. The design is simple. I was impressed enough that I bought four without knowing the price and I have already sold a pair. The receiver is that good. Best of all, first units will ship on February 20th! This is not some BS date that is going to be delayed for months, these receivers are real. Ashtech’s legendary tracking and RTK performance has not been abandoned. This receiver is Z-Blade based and it runs on $PASH commands. The Ashtech GNSS team lives. The SP80 tracks six constellations: GPS, GLONASS, Galileo, BeiDou, QZSS and SBAS. The SP80 is unique because it will fully fix on any of five of these constellations or a mix. So you can fix GPS only, GLONASS only, or BeiDou only. Time to fix is 50% better than the PM800, about 2 seconds for a 20-km baseline. If you don’t think this is a big deal, let me assure you it is. This morning at 10:00 am there were two GPS SV’s above 15 degrees elevation at our office. ProMark 120’s with GLONASS computed locations in seconds, while BD-970 and OEM-6 based receivers struggled for five minutes to get autonomous positions. Most (all other) receivers require a GPS only fix prior to using other constellations. Clearly Spectra has ended up being a good home for Team-Ashtech. I can tell that they have more resources and I suspect that being part of Trimble, they can throw significantly more weight around when sourcing technology. I have been wondering about the future of FAST Survey. Well, the next version of FAST Survey (Version 4.X) exists today. 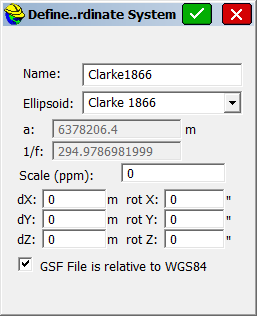 It is based on Carlson SurvCE version 3. (The version I saw was derived from SurvCE 3.80 and had been compiled on Feb 8th.) Not only does FAST 4.X support the SP-80, but it now supports the Focus 30 robot! 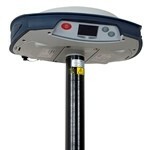 SurveyPro also fully supports the SP80. And SurveyPro sports a long list of new features too. 2-Year Warranty Standard. No firmware options–all options are enabled by default. WiFi: the SP-80 has built in B-G-N WiFi so there is no need to push corrections from the data collector up to the head through the Bluetooth channel. This means you don’t need an NTRIP client in the data collector, and in fact you don’t need a data collector. SMS Messaging (text messages) provide alerts if the batteries are low, or the base is moved. Anti-Theft Lock: When you set a base you can lock the head. If the head is removed from the location, it locks and starts sending SMS (text) messages and email with its new location. The buttons don’t work and the only way for the thief to get the receiver to stop beeping is to pull the batteries. However when power is next applied, the head will send its location and refuse to operate. 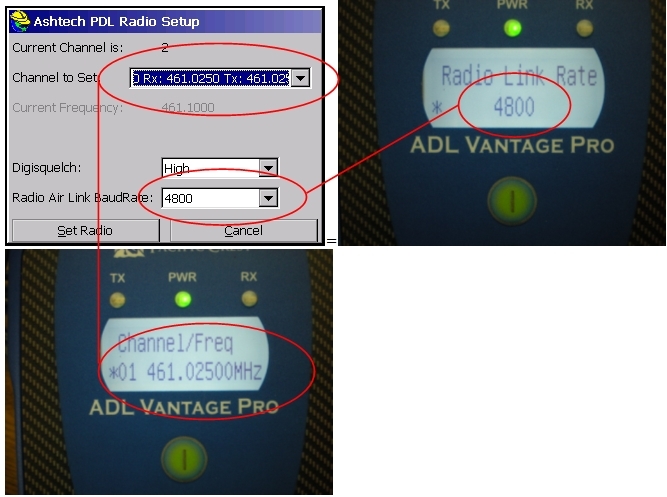 Internal UHF Radio: 2-watt ADL. That is twice the power of most internal radios. The radio antenna connection points downwards into a special fiberglass pole which protects the UHF antenna on the rover. It is AMAZINGLY sturdy. The SP-80 has a uniform propagation pattern, this results in better range without rotating the pole. The 2-watt radio will generate a lot of heat, but it has a big finned heat sink on the head bottom that radiates the heat away from the antenna and GNSS electronics. The USB connection is the standard mini connector and is accessible from the receiver side. The SIM and SD cards are also side accessible. Thankfully the SD card is full sized! (I can’t manipulate the micro SD cards, I really prefer the full sized cards and my new laptop has a hole that they fit into directly without an adapter.) Between the SD card and internal memory you have 31 gigabytes available. That should be plenty! Batteries: two standard batteries. When you open the battery door (which you can do with one hand) the batteries don’t fall out on your head. The XP-80 runs for 10 hours, twice as long as an R10 but only weighs 0.17 lbs more? The serial connector has a power input, so if you are using an external base radio, you don’t need a separate power connector to charge/power the head for extended periods. Tilt Sensors? The SP80 does not have tilt sensors. Display: The SP80 display is brighter than the PM800’s and you can set it to never dim. This receiver has the best display of any receiver on the market. You can simultaneously see the SV tracked vs. used count, the battery levels, the correction latency and most importantly the Fix/Float/Auto status. Serial Port: the serial port is pined to supply power to the head, so a base with an external radio can be directly powered from the radio’s battery without a separate cable. IP67 (not 66!) sealed case. This receiver is a big deal. I can’t wait until I get my first shipment (around the 25th of February!) If you are thinking about purchasing RTK, and you operate under difficult conditions, this will be worth taking a look at. Complete details were just made available [ here ]! SurvCE (and FAST Survey) don’t have NAD27 UTM projections built-in. So if you are working with an older dataset (like Oil and Gas) you are going to need to enter a new projection manually. 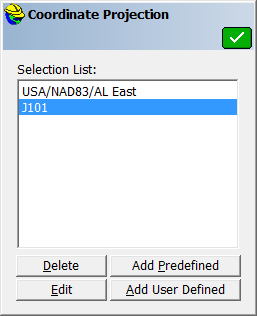 Press the ‘Add User Defined’ button. Configure to match as above. 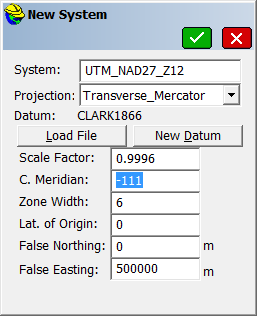 (You will need to adjust the C. Meridian to match your UTM Zone.) Then click the ‘New Datum’ button. Configure to match as above. Click the ‘Green Check Mark’ four times to return to the main menu. Enter the lat and lon as shown above. If you entered everything correctly, then the computed Northing and Easting will be as shown. 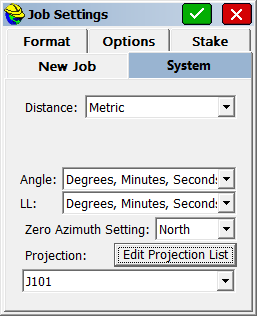 If you have a user defined projection in TBC (or SPSO) and want to move it to SurvCE (FAST Survey), you need to duplicate the projection in SurvCE. This document [ TBCtoSurvCE_R03 ] is a step-by-step. Don’t freak out: you can complete the entire calibration in less than 3 minutes once you get the numbers ready to cut and paste. What is the difference between a reference frame, a datum and a realization? 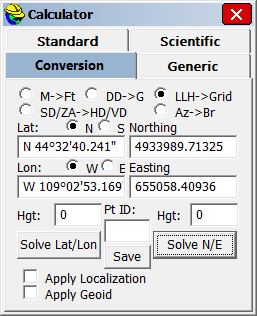 Why is timestamping coordinates important? What is the difference between NAD83 CORS96 and NAD83 2011? Why don’t ESRI products support these concepts? If you are like most people, it is all a nasty-ugly blur. Wouldn’t it be great if someone make a simple video with really smart presenters that started to explain all of this? Someone (Eric Gakstatter) did! And the video is great! It features Kevin Kelly the Geodesist from ESRI (who would have guessed that they had one?) Craig Greenwald and Michael Dennis from NGS who absolutely knocks it out of the park on this webinar. This [ link ] should get you the webinar recording. You have until September 18th 2013 to watch it. Do It Now! I can not recommend this webinar highly enough! It is fantastic. This method works with both ‘SurvCE’ and ‘FAST Survey’. 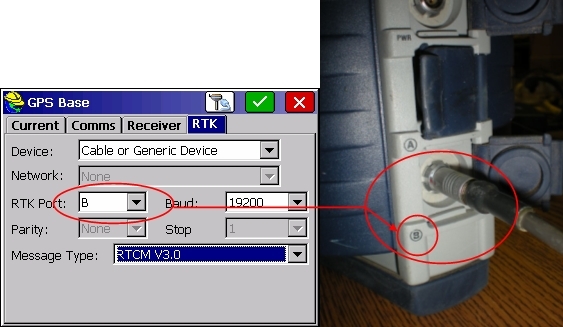 The easiest way to connect a Z-Max (or Z-Extreme) to a NTRIP or Direct IP is not with the factory GSM module. It is with a data collector, connected to the internet by Wi-Fi through a Mi-Fi device (or Bluetooth to cellphone,) and a serial connection from a COM port on the data collector to the Z-Max.